‘Amazing’, ‘fabulous’ and ‘brilliant’ are all words that were used last night to describe the B Band’s concert at Shelley College. What better way for the school to have the first public showing of its brand new theatre than to have it filled with the expert tones from a world-class performer and Skelmanthorpe B Band. 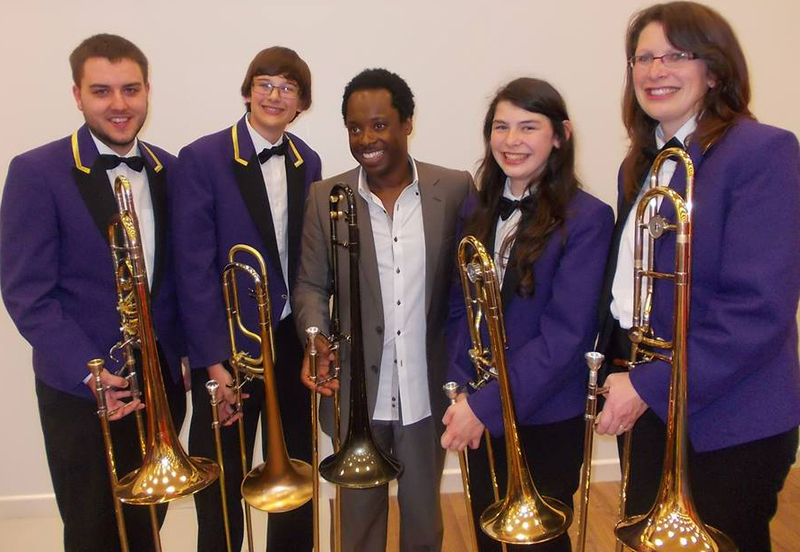 The band opened the concert with the appropriately named piece ‘Prelude for an occasion’; the occasion in this instance being international jazz trombonist, Dennis Rollins who, accompanied by the B Band, performed two numbers: Cry Me a River and Misty. The band brought the first half of the concert to a close and refreshments were served. The evening’s entertainment continued with performances from a group of extremely talented students who made up the Shelley College Jazz Band. Dennis joined them in their jazz improvisations before seating himself amid the band’s trombone section and finishing the evening as its newest recruit. Several members of the highly satisfied audience bought both band and Dennis Rollins CDs while Dennis himself busily signed autographs and chatted to everyone. Before leaving for his next gig in Morocco, Dennis had photographs taken with the band and mentioned how lovely it would be to do this again. The band whole-heartedly agreed. How fantastic would it be next time, to involve the band community as a whole. Watch our performance on YouTube.